Between August 7th and 15th 2017 will be held in A Guarda (Pontevedra) Festas do Monte, a festival declared of Tourist Interest of Galicia and one of the festivities of greatest impact in the region of Baixo Miño. This festival is a Celtic holiday whose beginning dates back to 1913. Since then, and every year, thousands of people participate for a week in a wide program that includes activities of various types, including the parade and “Día do Monte” those that congregate a greater amount of visitors. The beginning of the celebrations of this year mark the popular pedestrian races in the Alameda of A Guarda and the Trophy Festas do Monte of Rolley Hockey during the afternoon of Saturday 5th of August. From there, on the 7th, the central theme begins, and during that day and the following ones take place parades in charge of groups of bagpipes by the town, verbenas with known orchestras, samples of craftsmanship and gastronomic tastings, as well as a small Festival in the Plaza de As de Copas (XIII Rock in Fervenza), the traditional folkloric parade and the ascent to the mount of Santa Trega. The parties will end on Tuesday 15th with a spectacular fireworks display in the town’s harbor. Of all the programming, we have to make special mention to the ascent to the mountain, whose origin goes back to year 1912, when it was created in A Guarda the Pro-Monte Society of Santa Tecla, whose purpose was to revitalize religious celebrations of the hermitage, reforest the surroundings, improve the environment and construct a new access road to it. 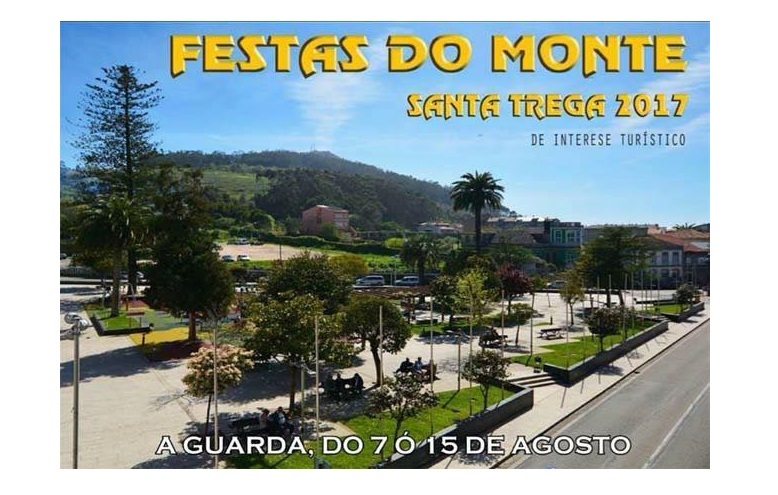 The following year, the society organized the first Festa do Monte and, although in its first editions it had a purely familiar character, soon became popular, becoming an annual celebration only interrupted during the Civil War. Today stands the pilgrimage of seafaring bands that rise from early morning to the summit of the mountain, frightening the bad omens to the sound of their drums and their bass drums. Once up, together with friends and family, they look for a shade under which to have lunch and spend the day that, this year, is Sunday 13th. With the advance of the afternoon they undertake the return to the town of A Guarda and all participate of a great verbena in which they will begin to think already in the celebration of the following year.